We loved the run down joint so much that we decided to go back there again for lunch the next day. If you are curious where this place is, it is just at the corner of Soi 7, Ratchada. Soi means street in Thai. The chicken rice is really affordable. It cost 30 BHT for small and 35 BHT for big. I decided to order 2 big ones. One for me and one for Zach. 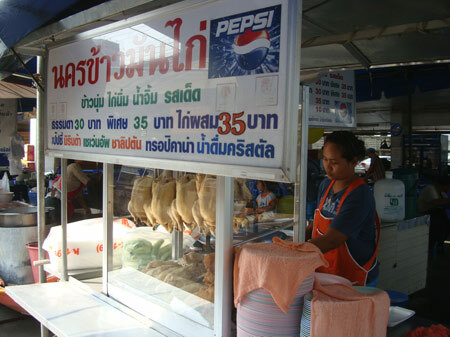 The stall offers 2 types of chicken. Boiled white chicken and crispy fried chicken cutlets. I decided to get one each and can do so sharing testing with Zach. For 35 BHT, the chicken rice set comes with the fragrant chicken rice, chopped chicken leg ( you can specify to the owner which part you like best ), a complimentary soup and 3 types of dips. The dips consists of chili, fermented black beans and thick soya sauce. The chicken rice is also served with some slice cucumbers. So basically everything you need for a meal is here. The complimentary soup is really tasty as you can see a lot of chicken feet and necks in the soup. Singapore is also famous for chicken rice. I’ve never made this dish myself as it takes a lot of effort and work to make this dish. I would say is quite hard and need a bit of cooking skills to make a decent chicken rice. I never bothered trying as chicken rice in Singapore just cost 2 SGD – 3 SGD. Is so convenient to just order from your neighborhood food court. Maybe one of these days I will gather up some courage to try to make this famous dish.